Wedding season is well and truly underway which means we have been buried in a sea of love and celebration. Watching the many months of preparation come together and getting to know our couples means we build a special rapport as you plan your ultimate country wedding. The highlight of owning a venue such as ours is seeing the pure joy and elation when a vision comes to light, creating a space that looks and feels like magic. Orchards at Spring Vale Farm truly is a venue like no other. It is the venue where every season compliments the property and every celebration will be remembered with love. The homestead and property offer an escape, where the world slows and worries drift. The care and maintenance of Orchards at Springvale Farm is paramount. A full time gardener is employed to keep the property pristine and looking it’s best all year round. The manicured gardens are beautiful and make a serene backdrop for memorable moments to be captured on camera. Holding off on booking a celebration until the warmer months isn’t always necessary either. Winter bookings can mean setting a cosy space with an open fire and fine local wines being enjoyed within the indoor warmth. The warmer weather may see our award winning cider or cuvee being sipped upon, under the stars while dancing the night away. When we first viewed Orchards we were able to straightaway envision the fairytale weddings that we would bear witness to. With the 1860’s bluestone homestead set amongst the manicured gardens, surrounded by rolling hills and country landscapes, we had ideas already dancing in our heads. Having access and relationships with some of the industry’s best stylists and suppliers means dreams can be brought to life. As Orchards has evolved so have the celebrations. Naming days, milestone birthdays, hen’s weekends and baby showers are just some of the occasions that we can host. Whether it is a large scale or smaller style celebration we can help you find the location to best suit your requirements within the property. Once the location has been decided upon it can then be personalised to suit personal taste and style. A venue can be just that, a venue. But, Orchards is far more. It is timeless and elegant yet has character and warmth; those key factors make a wonderful foundation to plan the celebrations of life’s most special events. Our bluestone homestead was built in the 1860’s. It’s the centrepiece of the property and a venue in its own right; it also has accommodation for up to ten guests. It is an elegant option for an intimate dinner and offers a stylish and inviting feel. The homestead, the fully self-contained two bedroom apartment and a cottage can also be booked for relaxing weekends away where you may simply want to escape the hustle and bustle of everyday life. From the living areas of the original homestead, French doors lead out onto our Italian tiled veranda. This is where champagne and canapé dreams are made. This space could be the ideal location for an afternoon bridal shower or pre dinner drinks. Sunsets and views are just another added bonus of taking a celebration away from the city and into the open countryside. 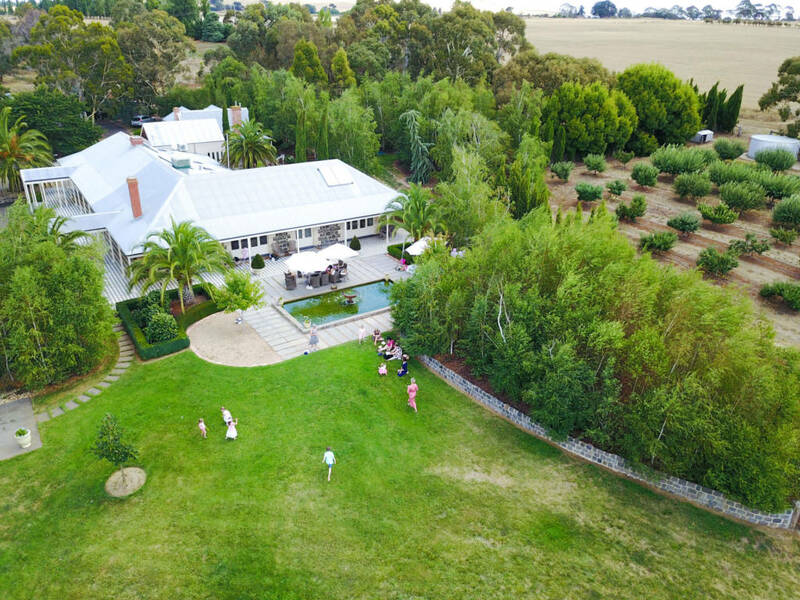 While guests mingle on the veranda and terrace they will admire the panoramic views across the rolling hills and over the 1,000 tree apple orchard. The options do not stop there though. Our Secret Garden is a treasure. Surrounded by original dry stone walls and silver birch corpses you could set the most beautiful high tea to suit a baby shower, naming day celebration or a special 1st birthday party. Guests can mingle into the evening while taking in the views that sprawl across the property. The secret garden is what fairy tales are made of…unique, and oh so pretty. 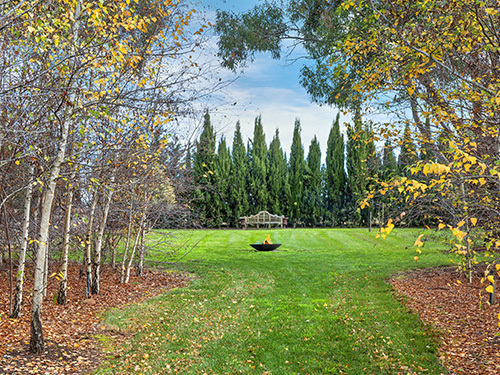 Orchards at Springvale Farm is vast in size and has lawn areas throughout making marquee structure another option. Our purpose built croquet court is amongst the large, grassed areas on site and could comfortably hold a sit down dinner for 200 guests. Marquees can be show stopping and allow for creativity and personality to be injected into a blank space. Our preferred suppliers are experienced in marquees of all sizes which can also include dance floors, lighting, floral installations and furniture. Choosing a venue is normally the first job on any list when planning an event. It is a personal choice. When talking to our clients for the first time we always ask them to make a time to come and view the property. It is at this appointment that we like to find out a few key points and encourage our clients to come prepared with any questions they may have. Once we know the occasion and the desired date we can then take you through the venue and full tour of the property. While walking through Orchards you will get the true feel and flow of the building and landscapes that sometimes only comes in person. You will see the charm and the calmness that made us fall in love with it and you will be able to clearly envision your celebration, whatever that may be, taking place. Before the end of this meeting we will have a thorough understanding of what it is you dream of and what would be the best option for you and your guests. While there are many factors that go into creating a memorable party, food is high on the list for any occasion. 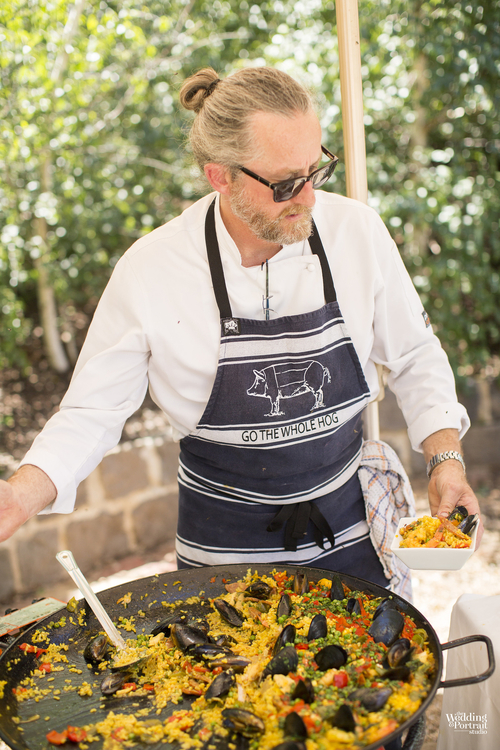 We are lucky enough to count the incredible Truffle Duck, Peter Rowland and Ed Dixon among our list of recommended caterers and can put you in touch.